Der Artikel Cecil Coles (1888-1918): Behind the Lines wurde in den Warenkorb gelegt. 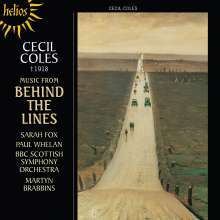 Born in Scotland in 1888, Cecil Coles studied composition at Edinburgh University, the London College of Music, and Morley College where he befriended Gustav Holst. He furthered his studies in Stuttgart, and was later appointed assistant conductor at the Stuttgart Royal Opera House. Forced to return to England before the outbreak of the First World War, he signed up for overseas service, and in 1915 was sent to the trenches in France. He continued to compose, including the particularly poignant work Behind the Lines (dated on the manuscript 'Feb 4th 1918, In the Field'). The first movement provides a sketch of a northern French pastoral landscape, the second, a heroic picture of a military funeral procession. Some two months later, aged just 29, the life of this extraordinarily gifted young musician was extinguished. Coles was killed near the Somme on 26th April 1918 during a heroic attempt to rescue some wounded comrades. He was one of the most talented of the composers who lost their lives in the First World War, yet few remember him now. 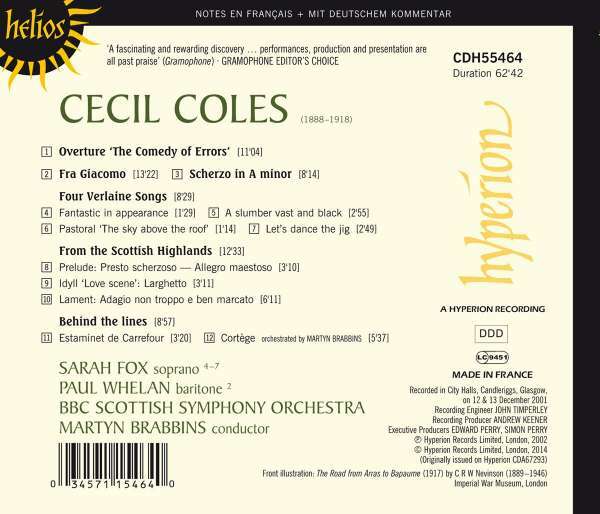 Thanks to the persistence and research of his daughter Penny Catherine Coles, his manuscripts, some still embedded with shrapnel, have been painstakingly pieced together helping to create this first commercial recording of these, indeed any of his compositions. In the words of the conductor, "this is a most exciting project, musically, socially and historically". Travelling on a journey somewhere between Mendelssohn and Bruckner or Richard Strauss via Brahms, the music is powerful, beautiful, and full of pathos and emotional intensity, performed here by the BBCSSO under Martyn Brabbins as expressively and passionately as it was composed.